Weather shouldn’t be an issue for Saturday’s races, so I’ll assume all MTOs are scratched while piecing together the all turf Late Pick Four ticket. The Late Pick Four starts with fillies and mares going one mile. This isn’t an easy sequence so I’m trying to get through the first couple legs of the wager with a limited number of horses on the ticket. Tasmona and Weave are both trying one mile for the first time, although I trust the connections (Castellano-Brown and Rosario-Motion) enough to use them. Stock Fund intrigues me at 12-1 in the morning line with Alex Solis and will throw her in the mix too. I think one mile is her best distance, and she has hit the board in four of five starts at Saratoga. I won’t use Devilish Love, but her effort last out merits respect in here. After the scratches of MTOs, a tricky field of nine goes at it in an optional claimer at one mile and an eighth. Hard Enough is dropping out of the Grade II Monmouth, and he’s 2-for-4 at this distance. Star Channel gets a huge jockey change to Jose Lezcano, while North Star Boy has been consistent in his last three starts and note a couple of bullet works leading up to the race. I don’t want Pyrite Mountain or Battle Force, who are both coming off a layoff. The first Grade I of the meet, the Diana came up an extremely tough race. The ‘ALL’ button might be the way to go in here because you can make a case for the majority of the horses. I’ll use half the field, while taking a stance against Emollient. She is a talented horse, but I have concerns about her wiring the field at the distance and she will likely be overbet. Abaco and Strathnaver are my longshot plays. I’ll excuse Abaco’s last race on a yielding turf course in the Sheepshead Bay, and I like the turnback to one mile and an eighth. Strathnaver almost pulled off the upset in the Just A Game, and the extra furlong should only help. Alterite has a lot of competition off a layoff, but I don’t want her to be the one to break up the ticket. Stephanie’s Kitten and Tannery won’t save too much ground from the outside post. However, they offer nice value at 6-1. If we can survive the first three legs of the wager, it won’t get any easier with the one mile and sixteenth allowance in the finale. All Included looked good breaking his maiden in his first start on grass. 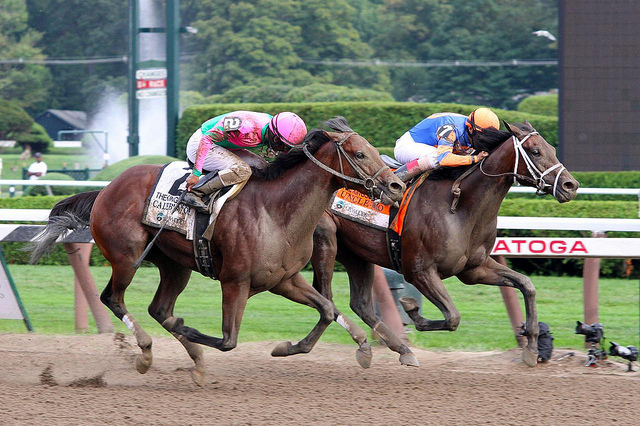 Unfortunately, the odds won’t be great because it’s Castellano-Pletcher. Bingo Kitten is making a second start off a layoff for Rosario-Ramsey. I don’t expect 5-1 by post time though. The Linda Rice duo of Make a Decision and Alarmed Ndangerous will also give us a winning ticket. Alarmed Ndangerous is making his second start off layoff for Linda Rice — a good angle and he seems to like Saratoga. Make a Decision had a tough trip last time in the stretch last out. Image: Mike L, “Caleb’s Posse – 2011 Kings Bishop”. Copyright 2011.